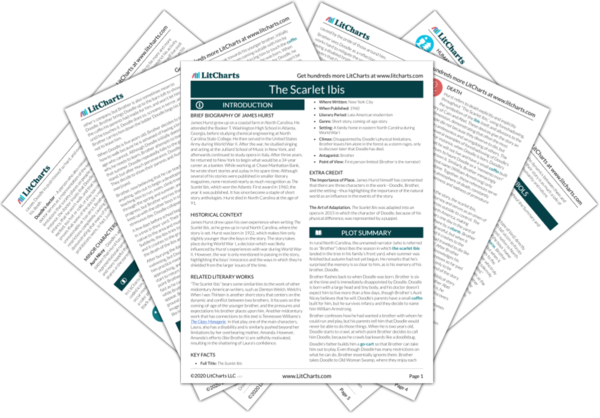 Instant downloads of all 946 LitChart PDFs (including The Scarlet Ibis). 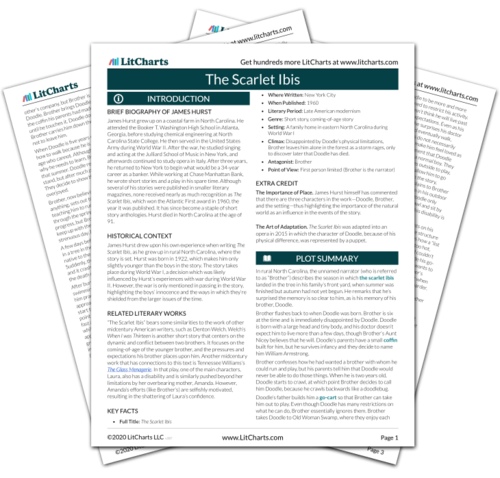 Welcome to the LitCharts study guide on James Hurst's The Scarlet Ibis. Created by the original team behind SparkNotes, LitCharts are the world's best literature guides. A concise biography of James Hurst plus historical and literary context for The Scarlet Ibis. A quick-reference summary: The Scarlet Ibis on a single page. In-depth summary and analysis of every of The Scarlet Ibis. Visual theme-tracking, too. Explanations, analysis, and visualizations of The Scarlet Ibis's themes. The Scarlet Ibis's important quotes, sortable by theme, character, or . Description, analysis, and timelines for The Scarlet Ibis's characters. Explanations of The Scarlet Ibis's symbols, and tracking of where they appear. An interactive data visualization of The Scarlet Ibis's plot and themes. James Hurst grew up on a coastal farm in North Carolina. He attended the Booker T. Washington High School in Atlanta, Georgia, before studying chemical engineering at North Carolina State College. He then served in the United States Army during World War II. After the war, he studied singing and acting at the Julliard School of Music in New York, and afterwards continued to study opera in Italy. After three years, he returned to New York to begin what would be a 34-year career as a banker. While working at Chase Manhattan Bank, he wrote short stories and a play in his spare time. Although several of his stories were published in smaller literary magazines, none received nearly as much recognition as The Scarlet Ibis, which won the Atlantic First award in 1960, the year it was published. It has since become a staple of short story anthologies. Hurst died in North Carolina at the age of 91. 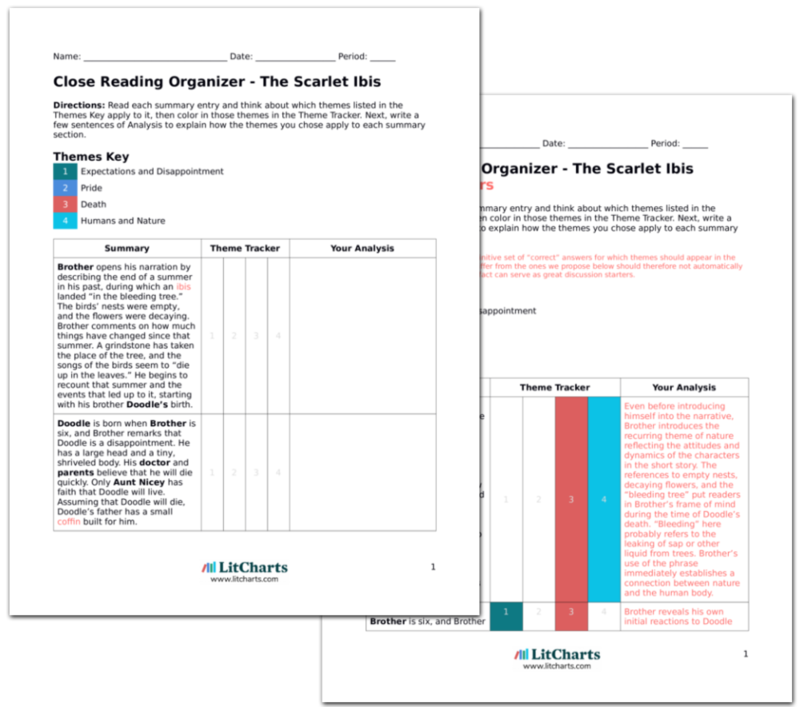 Get the entire The Scarlet Ibis LitChart as a printable PDF. James Hurst drew upon his own experience when writing The Scarlet Ibis, as he grew up in rural North Carolina, where the story is set. Hurst was born in 1922, which makes him only slightly younger than the boys in the story. The story takes place during World War I, a decision which was likely influenced by Hurst’s experiences with war during World War II. However, the war is only mentioned in passing in the story, highlighting the boys’ innocence and the ways in which they’re shielded from the larger issues of the time. “The Scarlet Ibis” bears some similarities to the work of other midcentury American writers, such as Denton Welch. Welch’s When I was Thirteen is another short story that centers on the dynamic and conflict between two brothers. It focuses on the coming-of-age of the younger brother, and the pressures and expectations his brother places upon him. Another midcentury work that has connections to this text is Tennessee Williams’s The Glass Menagerie. In that play, one of the main characters, Laura, also has a disability and is similarly pushed beyond her limitations by her overbearing mother, Amanda. However, Amanda’s efforts (like Brother’s) are selfishly motivated, resulting in the shattering of Laura’s confidence. Climax: Disappointed by Doodle’s physical limitations, Brother leaves him alone in the forest as a storm rages, only to discover later that Doodle has died. The Importance of Place. James Hurst himself has commented that there are three characters in the work—Doodle, Brother, and the setting—thus highlighting the importance of the natural world as an influence in the events of the story. The Art of Adaptation. The Scarlet Ibis was adapted into an opera in 2015 in which the character of Doodle, because of his physical difference, was represented by a puppet. Emanuel, Lizzy. "The Scarlet Ibis." LitCharts. LitCharts LLC, 7 Feb 2018. Web. 24 Apr 2019. Emanuel, Lizzy. "The Scarlet Ibis." LitCharts LLC, February 7, 2018. Retrieved April 24, 2019. https://www.litcharts.com/lit/the-scarlet-ibis.